"This was a favorite summertime treat in our house and one of the many recipes that was passed down to me from my mom." Beat heavy cream in a bowl with an electric mixer or whisk until stiff peaks form. Beat cream cheese, confectioners' sugar, lemon juice, and vanilla extract in another bowl until smooth. Fold whipped cream into cream cheese mixture until evenly blended. Line pie crust with banana slices and spread cream cheese mixture over bananas. Spread blueberry pie filling over cream cheese mixture. Refrigerate at least 2 hours before serving. Delicious and better the next day. Huge hit with my boyfriend and his girls! This was yummy! It's my kids favorite dessert now. Great recipe! 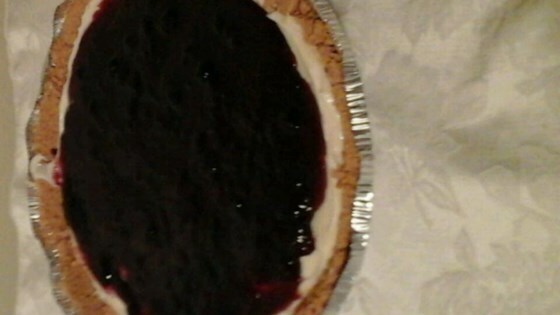 I needed to use up some cream cheese, blueberries, etc., and this was the perfect pie to make.